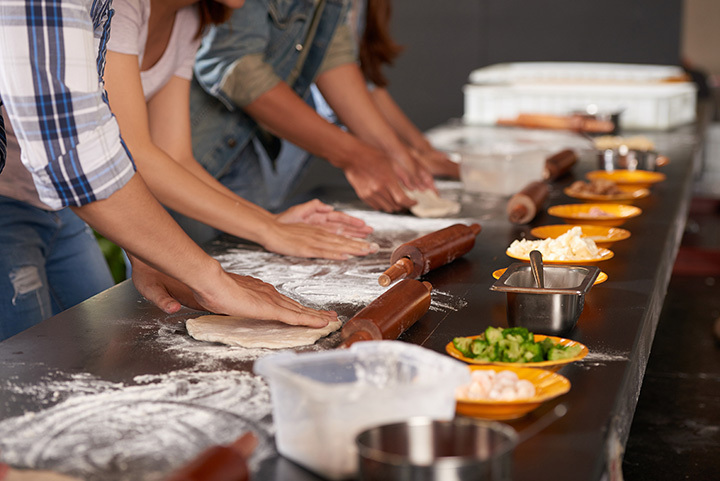 If you’re a food lover looking to take their skills to the next level, Kentucky’s wide array of cooking class options will help bolster your culinary tool belt. From in-depth baking courses to basic meals, here are the 10 best cooking classes in the state. You’ll have a wild time cooking with Wild Thyme Cooking classes. Held at their state-of-the-art facility in Lexington, Wild Thyme offers gourmet on the go classes for the foodie who doesn’t just love to eat food, but prepare it. Classes are created to inspire, educate, and empower people of all ages to reach their untapped potential in learning about food and how to prepare it. You’ll feel like you’re on the set with Masterchef when you take one of the exciting group classes at Millies. Located in Louisville, you’ll be making awesome meals in no time with the help of the professional instructors in this fun and fast-paced kitchen. Beginner or expert, come expecting a good time and good food. People of all ages can enjoy learning new concepts around food and food preparation at the Baker-Hunt Art & Cultural Center in Covington, Kentucky. The mission of the Center is to provide learning opportunities in a variety of areas including edible food art. This fun 8-session class explores baking and cooking for ages nine and up. The best part is that you get to eat your art at the end of the class! For a fun and tasteful evening, sign up for one of the exciting cooking classes at Stuarto’s. Held in Lexington the second Wednesday of each month, these two-hour classes are hosted by seasoned cooks. You’ll prepare a delicious four-course meal that will have your mouth watering. You’ll leave with more confidence in your cooking abilities, new friends, and a lasting memory. The Farmer and the Foodie cooking classes are a great way to spend the evening. Your food adventure starts in the kitchen garden where you’ll learn about the best ingredients to compliment your meal. Using fresh produce and the best meats available, you’ll have a fun hands-on experience with professional chefs guiding you all the way. Martha Layne Collins High School in Shelbyville isn’t your ordinary high school. This unique and award-winning public school offers students the chance to participate in hand-on learning activities year-round. Students in grades 8-12 are also encouraged to put their creativity to use in developing ideas that they prepare and share. If you’re ready to take your love of cooking to a new level, consider enrolling at Austin Peay State University located in Fort Campbell. Listed as one of Kentucky’s top 10 best culinary schools, Austin Peay has programs and certificates in culinary arts that will allow you to gain practical experience in all aspects of food preparation and service. It’s up to you what to do what that once you complete the classes, but it opens doors that wouldn’t have been available before. A degree in culinary arts is only a step away. That step involves contacting the Ashland Community & Technical College to see what the requirements are for pursing your passion for food. You’ll have experienced and professional chefs working with you, and you can earn an associate’s degree in as little as 16 months. It’s a great return on the investment to put your love of food into a career. William Sonoma has long been known for having some of the best cookware, kitchen accessories, and gourmet items, but did you know you can take your love of food to a new level by signing up for one of their cooking classes? Williams Sonoma in Lexington offers classes on technique, using gourmet ingredients, and that feature recipes from popular cookbooks. There are even classes for kids age 8-13 to get them inspired. You’ll create anything from basic meals to gourmet delights when you take a class taught by Chef Phil Dunn. He also takes interested foodies who want to increase their knowledge of traditional foods on international trips where you can experience authentic recipes made with local ingredients. You can benefit from Phil’s impressive experience in a fun and delicious way.